Landslides are a serious geological hazard throughout the tropical and sub-tropical regions of the world. They can often become catastrophic and result in loss of life, human injury, economic loss, and damage to social, cultural and natural heritage. In recent years, research on landsides and related natural phenomena has been significantly advancing, but there are only a few specialized platforms for research publications. There is greater need of knowledge transfer and research result dissemination among the landslide researchers through such specialized publications. This situation is especially the case among Asian geo-scientists working in the fields of landslide and related geodisasters. To overcome this problem, the Himalayan Landslide Society (HiLS) is initiating a new scientific journal entitled "International Journal of Landslide and Environment". HiLS believes that geoscientists, environmentalists, and engineers involved in landslide and environmental research will have access to a new common platform for the publication of their research work. HiLS is confident that, with this journal, stakeholders working in the Himalayan landslide and environmental issues will also get up-to-date information on landslide and related research work in the Himalaya as well as other parts of the world. Click here to download guideline for Authors. International Journal of Landslide and Environment is now accepting manuscript. Please submit online. Template for Manuscript is available, click here. Guideline to author is available here. To submit manuscript online, click here. Issue Vol. 2 No. 1 published online. 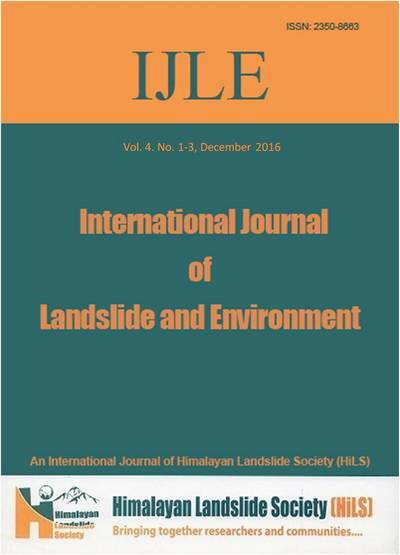 International Journal of Landslide and Environment has just published its latest issue Vol. 2 No. 1.